Selected Science News: WHERE ARE ALL THE FLOWERS FROM? Amborella trichopoda, the world’s most ancient flowering plant, bloomed at the University’s Botanic Garden this autumn. The Garden’s Director, Professor Simon Hiscock, believes this unusual specimen may hold the key to unravelling Darwin’s ‘abominable mystery’ – the evolutionary origin of flowering plants. The first flowering plants, or angiosperms, suddenly appeared over 130 million years ago, an event that perplexed Charles Darwin and remains a puzzle even now. Today the closest living relative of these flowers, Amborella trichopoda, is confined in the wild to the remote south Pacific island of New Caledonia. In 1999, new DNA evidence revealed that this strange specimen, with its tiny male or female flowers on separate plants, was the most primitive angiosperm alive, rather than the showier Magnolias as previously thought. Since this revelation, many attempts have been made to collect and grow Amborella seeds. Most of these have failed, however, and because the unimpressive flowers have no commercial appeal the horticulture industry has shown no interest in them. Bristol's is the only Botanic Garden in the UK, and one of just a handful of gardens worldwide, where Amborella has been successfully grown, from seeds collected by Professor Hiscock during a trip to New Caledonia in 2007 with botanists from the University of Lyon, France. One of the reasons that Amborella is so fascinating is that, unlike most angiosperms, the male and female reproductive organs occur on different plants. More than 95% of angiosperms are co-sexual, with both male and female reproductive organs in the same flower. This optimises reproductive efficiency and can allow self-fertilisation in the absence of pollinators. The flowers on co-sexual plants comprise both stamens, the male reproductive organs that produce pollen, and pistils, the female reproductive parts made up of one or more seed-bearing carpels. By contrast, male Amborella flowers comprise only stamens, while the females consist of a cluster of carpels, even though the fossil record suggests that Amborella’s ancestors were originally co-sexual. 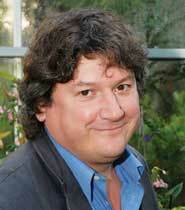 One of Professor Hiscock’s collaborators at the University of Lyon, Dr Charlie Scutt, has demonstrated that certain genes involved in carpel development in Arabidopsis thaliana – a more recently evolved angiosperm widely used as a model organism in plant biology – play a similar role in Amborella flower development. Scutt and others have also shown that during the evolution of the flower these genes were co-opted from leaf development into carpel development, which must have been a critical step in the evolution of the angiosperm flower and its unique female reproductive structure, the carpel. Using a similar approach, Professor Hiscock intends to use Amborella in his own research on reproduction in flowering plants to determine whether genes found in Amborella pollen and pistil are similar to those identified in Arabidopsis. This will provide important new insights into the evolution of the pollen-pistil interaction – a reproductive mechanism unique to angiosperms.